Nukakamma Guest House - Colchester / Cannonville Accommodation. each. All our beds are purchased from Cloud 9 and covered in high quality linen to ensure that our guest's evenings are just as relaxing and enjoyable as their days. Our fully equipped kitchen including stove and oven as well as laundry facilities ensures the necessities are all intact whilst enjoying your holiday. A lounge and dining room area adds to the homeliness and should you be looking for a quiet night inside, we have a TV with a select DSTV bouquet for you. Alternatively, the outdoor types might prefer having a BBQ on your private deck whilst enjoying a sundowner. Breakfast and dinner is not included in our self-catering apartment but can be arranged at an additional cost. Please ensure to enquire about this. Beautifully fitted with a high quality king size bed, crisp white linen and freshly laundered towels. Bedside lamps for midnight reading rests on two stunning wooden bedside tables which complement our wooden cupboard, mirror frame and occasional table all unique and purpose build for our guest house. With an en-suite shower and toilet, and complimentary soaps and shampoos, you are sure to enjoy relaxing in your room. To help you unwind after a long day of activities, our hospitality tray with coffee and tea will make you feel invigorated. For added privacy, this room has a separate entrance from the main house entrance. This spacious room has a stunning view of the Addo park right from the luxury of your own private viewing deck, where you can spot some elephants whilst getting ready in the morning for our delicious home breakfast. The room is equipped with a high quality king size bed and 100% white cotton linen and luxurious towels. Beautifully made rustic wooden furniture fills this room and gives it that true African feeling. Enjoy complimentary tea and coffee in your own private lounge area. This room also has an en-suite shower and toilet. Do you do airport transfers, organize trips? No we do not but can be arranged. We also arrange game viewing trips and have standing arrangements with most of the bigger game farms in the area, to collect guests at the guest house and also drop them off again. 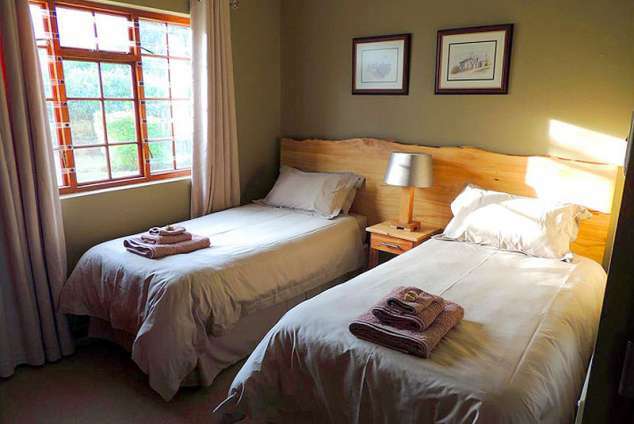 Detail description : Nukakamma Guest House borders with the Addo Elephant park and timeless views of the park can be enjoyed from our private viewing deck. 1094 page views since 03 Jul, 2015. Last updated on 17 Jan, 2019.